NCAA Official Final Four Sponsor, Pontiac has brought in The Street Basketball Association to direct and choreograph an abbreviated version of "The SBA Show and Expo." The SBA will provide additional entertainment for Pontiac's Final Four Party Event on Sunday, April 4th in San Antonio, Texas with 3-3 and 2-2 competitions as well as free-style dribbling demonstrations by SBA All-star magician, Pat "Da-Roc" Robinson. In addition, the SBA will work with Pontiac Party Host Greg Gumbel and Bill Walton to produce a slam-dunk contest between SBA All-stars Hugh "Baby Shaq" Jones, John "Helicopter" Humphries, Dennis "Spyda" Chism, Jason "The Birdman" Williams, Lou "Certified" White, and Charles "Flat-Out:" Ward. The winner will be crowned Pontiac's "Fuel for the Soul" Slam Dunk Champion. "We are looking forward to putting on a Show in San Antonio for Pontiac. I think everyone at the event will enjoy and be amazed at the athleticism and showmanship of our creative All-stars," states Psaha Luke, Director of Entertainment and Special Events for the SBA. The SBA has created a turnkey entertainment product titled "The Show and Street Ball Expo" which has been highly effective for companies and promoters worldwide looking for a competitive, educational, and entertaining offering within the basketball and entertainment industry. The SBA is a marketing, sports and entertainment company primarily focused on the business of basketball, specifically dedicated to spearheading the growth and development of street basketball. 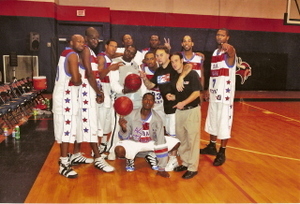 As the first professional street basketball league, the SBA gives street basketball players an opportunity to showcase their talents for scouts, agents, coaches and fans. During the off-season, the SBA has exhibition games and tours throughout the world. To book the SBA Show and Expo, SBA players for camps, clinics, speaking engagements, marketing endorsements, commercials, movies, television shows, and/or street ball exhibition games please contact Matthew Rosner, Director of Basketball at 202 409-6206.